This week finds the cast missing one of their own…Buddy was unable to make the show this week due to a restraining order. So to make up for that missing voice, a last minute text message gets the “Guest Villianess” Doug Wilkey in the studio to lend his two cents. The rest of the gang is in place…Al, Marnie and Clayton. This is the final show in the old studio for the cast before they start production in their new home next week! 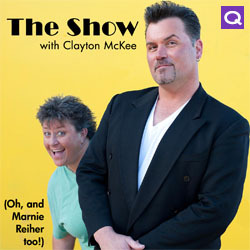 There are headlines, sports, random topics, laughter and vulgarity every week with this cast of “The Show With Clayton McKee”. Thanks for listening, downloading and playing along!